Now that I'm retired, I take a lot longer to shop! I have a Sam's Club membership, frequent WalMart and love Publix Grocery. One of the things I've found is that prices on any given item or on any given day can be lower at any one of the three! Last week we priced Atkins Nutrition Bars and saved well over a dollar by buying 3 boxes at WalMart rather than one triple size box at Sam's. Since there are only two of us, sizes of consumables at Sam's means waste, but sometimes it's less expensive to buy large and give some away if you can't use it all especially fruit. Several of our friends shop together and split large packages but I've never found anyone that likes everything I like! I'm always partial to Publix meat because Sam's and WalMart have not proved to be that good in quality. Both Woody and I are not afraid to buy clothes at Sam's since they often have Ralph Lauren Polo, Nautica, Levi's, Calvin Klein and other brand names. Clothes shopping does require trying clothes over clothes (which looks a little funny I know), knowing how designers' fit or being prepared to return things that don't fit when you get them home. We've also found that brand name grandchildren clothes can also be found at Sam's but are often cheaper at WalMart! As fast as kids grown and as rough as day care is, Garanimals at WalMart are cheaper than Carter's or OshKosh. You can still buy a really special outfit occasionally...but just sayin...to go to WalMart or work in the yard, you don't need designer duds...you might be overdressed. Woody and I also entertain ourselves with shopping if we can't think of anything else to do on a rainy day. We love to browse Sam's and sample food! So enjoy shopping but bottom line...watch pricing and try not to impulse buy! I don't even know where to begin! I have been working for The Oncology Group in Amarillo, TX and Las Cruces, NM for the past few months and have really enjoyed it...however, it has left little time for "retirement"! We always talk about working part time or occasionally in retirement for extra spending money but sometimes it does get out of hand. All that being said, the job is finished so I'm back to having a few moments for myself again. To catch you up, we went to see Mary Poppins in February which was fabulous, popped up to Metropolis to the casino and hit Lobster day in the buffet, and went to see Mirror Mirror which we loved. 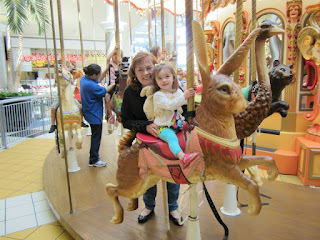 We took Savannah to Jackson for the weekend to swim and visit family a few weeks ago, went to see the Easter bunny and rode the train and carousel and had a wonderful Easter Sunday cookout with the family. Savannah turned 2 on April 12th and had her party on Saturday the 14th, we did our groupie thing and went to see the Boomerangs that Saturday night and also back in February too, and then drove to Jackson to see my sweet sistuh Dana star in Lend Me A Tenor for the Jackson Theater Guild on Sunday! In between, I broke the garbage disposal and bruised my rib or pulled some cartilage! Don't ask...but if you must know...if you put a penny in a tulip vase to get them to stand up, don't pour the water out in the garbage disposal and then turn it on! One stuck penny and one useless blade. I have little tomatoes on my plants on the screened porch, basil coming up, mint and rosemary running amuck and a gardenia tree that is suffering...not sure what I'm doing wrong. The iris and roses are thriving but I still need to plant a few annuals to brighten up the yard. My flipper is improving slowly after three weeks of Occupational Therapy with Jessica who was wonderful...that's my broken wrist and damaged tendons....but Woody likens me to Nemo with a busted flipper! 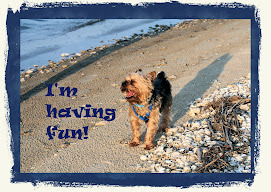 So all in all...you are now sort of caught up on our fun things! Miss S and Grandad watching cartoons on Saturday morning in Jackson!! 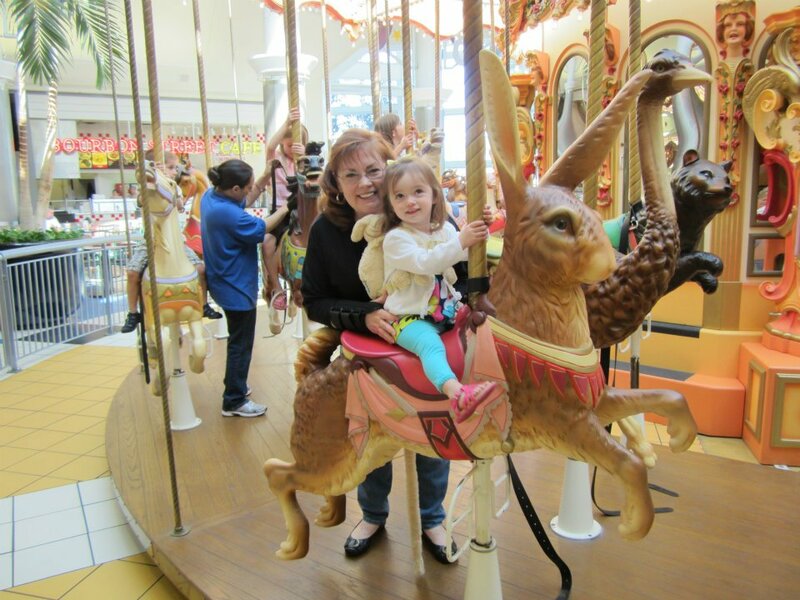 and Mimi and Savannah riding the carousel...and the Easter Bunny! I promise to post more pictures later, but I have to move them from the camera to here!! Like I said...I have been way too busy! So your tip for the day is don't get so busy working that you forget to have fun! !